Since 1947, the Cardinal Cushing Centers have been at the forefront of serving those with special needs. Today, our leadership team expands on that tradition, by continuing to pioneer new and better ideas in teaching, transition programs, employment, and community living through innovative facilities, curriculum, and programs. Von Ahn is an experienced leader in nonprofit management and disability services. Prior to his role as President & CEO at Cushing, Von Ahn had an eleven year tenure as Executive Director of Warren, Washington & Albany Counties ARC (WWAARC), A Chapter of The Arc New York. Prior to his role at WWAARC, Von Ahn was General Counsel and Executive Director of Legal Affairs for the Arc of New York. As Executive Director of WWAARC, Von Ahn oversaw the day-to-day operations of a multi-divisional, $40 million Chapter of the Arc of New York which provides services daily to over 1,000 individuals with intellectual and other developmental disabilities including residential, day habilitation, Medicaid service coordination, family support services, supported employment, vocational rehabilitation, workshop, and guardianship. During his tenure, Von Ahn transitioned one hundred percent of the Medicaid Service Coordinators to a Care Coordination Organization without a disruption in service to the individuals they were supporting, and successfully coordinated the merger of the larger Albany County Chapter ($27M) into the smaller Warren & Washington Counties Chapter ($14M) in a reverse merger. WWAARC has since become one of The Arc of New York’s highest net margin operating chapter. Von Ahn is a graduate of the State University of New York at Albany, where he also received his Masters of Science Degree in Taxation. He received his Juris Doctor from Albany Law School of Union University. Jansi Chandler has been a development professional for 30 years, specializing in public and private development. Since April 2012 she has held the position of VP of Development at Cardinal Cushing Centers, where she is responsible for all fundraising for the organization as well as overseeing its development projects. Prior to that she was the Director of Development at Grant Communications Consulting Group where she provided technical assistance in nonprofit development, specializing in capital and annual campaigns. She has also held the position of Managing Director for Economic Development for the Boston Redevelopment Authority, overseeing the day-to-day operations of the six departments and 70 staff that make up the Economic Development Division. For 11 years, she was the executive director of the Lynn (MA) Department of Community Development and obtained and implemented state and federal grants of more than $80 million for housing, community-and economic development programs. Ms. Chandler has a B.A. from Connecticut College and an M.B.A. from Suffolk University. Sig Kozaryn obtained his BS in accounting from Quinnipiac University, and has various experience in nonprofit and profit organizations. He helped start a battered women’s shelter on Cape Cod, a Buddhist meditation center, and has served on the board of several nonprofit corporations. He also serves on the MAAPS Contract & Reimbursement committee. 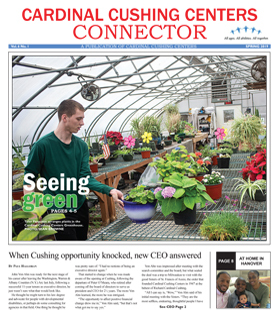 Sig oversees the overall financial and operation activities of Cardinal Cushing Centers Inc. He serves as the V.P Finance and Treasurer for CCC Board of Directors as well. Sig joined the organization in 1999. In addition to overseeing the Finance Department, Sig is responsible for preparing and presenting quarterly and annual financial statements to the Board of Directors, as well as preparing the UFR and financial statements for the auditors. Other duties include strategic planning, preparing budgets, analyzing and reviewing contracts, preparation of DDS contracts, and implementing financial controls over policy and procedures to ensure validity of the company’s financial statements and reporting. Michelle Markowitz has a BS in Psychology from Bridgewater State College and has been at Cardinal Cushing since 1998. Michelle’s extraordinary passion and commitment to the field of Special Education began at an early age. As a high school student, she volunteered at Braintree St. Coletta’s Day School where she did afterschool programming and summer camp with students. Michelle has held various positions at Cardinal Cushing Centers including the Education and Residential Departments, rounding out her comprehensive knowledge of Cardinal Cushing’s program and services. Currently as Vice President of Admissions and Administration, Michelle is responsible for the Admissions process including but not limited to: initial review of all applicants, touring and interviewing families and students for potential placements, facilitating discussions for acceptance at Board of Admissions meetings and completion of extensive admissions processes. In her role, Michelle is responsible for national and international recruitment. Michelle spends a lot of time cultivating and enriching relationships with not only families and students but also educational consultants, school districts, special education attorneys, advocates, and other referring agencies. Michelle represents the organization at many conferences throughout the year and has served on the National Association of Therapeutic Schools and Programs National Conference Committee as well as represents the organization through the Independent Small Programs Alliance. Michelle is an active member of the South Shore Young Professionals Group as well as a member of the Senior Leadership Team at Cardinal Cushing Centers. Additionally, Michelle supervises the Maintenance and IT Departments. Jean Rogers has an MS in Counseling and a BS in Human Services Administration, and has been the VP of Adult Services at Cardinal Cushing Centers for fourteen years. Previously, Jean was the Program Administrator at the Kennedy-Donovan Center for eighteen years. As the VP of Adult Services, Jean’s responsibilities include but are not limited to: Coordinating all aspects of Residential and Employment programs supporting over one hundred individuals. She maintains the highest level of licensure through the Department of Developmental Services office of Quality Assurance and CARF. To develop and monitor budgets for all Adult Services programs, as well as pursue additional funding sources beyond DDS and MRC. She is responsible for Quality of Assurance for all Adult Services programs, as well as overseeing upkeep and maintenance of all of the facilities. Jean actively pursues new referrals for our existing day and residential programs, and develops new programs including Day Habilitation and Individual Support. Aindrea Benduzek has been working at Cardinal Cushing Centers since May of 2011. Aindrea started with Cushing as a job coach at South Shore Industries in Braintree where she worked with adults with intellectual and developmental disabilities and supported them in the community through volunteer and employment opportunities. Aindrea transitioned to Adult Service Residential in 2013 where she is now the Director of 14 adult homes and oversees the residential nursing department. In 2015, Aindrea completed her MA in Conflict Resolution which included an internship in mediation. She also has a BA in English and Sociology and a Graduate Certificate in Politics and Public Policy. Aindrea completed the DDS Leadership Series and has a strong passion for advocacy in regards to community inclusion, social role valorization and Human Rights. She also is a member of the Human Rights Committee. Pat Conley graduated from UMass Dartmouth with a BS in Marketing. Her previous work experience includes the role of Traffic Supervisor at Frito Lay and the Central Logistics Distribution Manager at Honeywell. After that, she took some time off to raise her family and help grow her husband’s pest control business. She made a career change in 2005 and started working at Cushing as a Direct Support Person in the Education Department. She also worked in the Health Center before transferring into Adult Services. There she’s held positions as a Residential House Manager, Case Manager, and Residential Coordinator. In 2013, she was promoted to Director of Adult Family Care. Adult Family Care (AFC) is a MassHealth program that helps individuals, ages 16 and older, live in the community with related or non-related families and offers financial assistance and support services. When not working, Pat is an avid bike rider and enjoys being outdoors and with her family. Gerry has been in the Food Service Industry for over 35 years, the past 27 as the Food Service Director at Cardinal Cushing School. A career that started in the United States Coast Guard, where he served proudly for 4 years, before working in the health care industry and then to Cardinal Cushing School. Gerry’s culinary training began in the Coast Guard; he then preceded to Northeastern University’s, “Chefs Training Institute”, and also received a degree in Culinary Arts from Johnson and Wales University. His primary duties at Cardinal Cushing are overseeing all aspects of food service, covering the day to day operations, as well as special events. Gerry and his wife Joyce, who also works at Cardinal Cushing School, reside in Rockland with their two children Amy and Patrick. Gerry and Joyce recently became the proud grandparents of Liam Haynes, son of their daughter Amy and son- in- law Paul. In his free time, he enjoys coaching soccer and basketball for The Special Olympics Adult Service Program. Tara Finn has been working with individuals with intellectual and developmental disabilities for over 16 years as behavior specialist and a residential director. Prior to her role as Associate Vice President of Adult Services, Tara held the position of Senior Program Director at Friendship Home, overseeing recreational, vocational and site-based respite programs. Tara has her Master’s degree in Mental Health Counseling and currently serves on the DDS Regional Diversity Council, Leadership Committee and is on the Statewide Initiative “Creating Our Commonwealth,” which advocates for inclusion of people who have disabilities. She is also Chair of the Human Rights Committee at Cardinal Cushing Centers and is a member of the Residential HR Advisory Committee to the Commissioner of Massachusetts’ Department of Developmental Services. Doug Frazier has been in the field of education for 35 years. Twenty eight of those years have been with Cardinal Cushing Centers. He is currently the Senior Director of Vocational Services (CORE program) at Cardinal Cushing Centers – Hanover and has served in that position for six years. Doug oversees the vocational/educational program for students from the ages 18 – 22. This includes classrooms, on-site and off-site vocational/educational experiences for students. Prior to working in vocational services at the school, Doug worked in student services, teaching and admissions. Before working at Cushing he was in the field of college administration – student housing, activities and financial aid. Mr. Frazier has a B.A. from MCLA, a M.Ed. from Bridgewater State University and holds his teaching licensure in special education. Angela Gokey has been working with individuals with intellectual disabilities for over 20 years. Prior to coming to Cardinal Cushing Centers, she was a Director for Vinfen Corporation and the May Institute, supervising both Day Habilitation and Employment programs. In her current position of Director of Day Services, she supervises the Life Opportunities Unlimited and South Shore Industries programs. Angela has extensive experience with program development, and she is currently working on the expansion of day supports in both the Hanover and Braintree communities. Angela received her undergraduate degree in Sociology & Anthropology from Colgate University. Tom joined Cardinal Cushing Centers in 1998 but started his career in trades back in 1985. He is a licensed Plumber and Gas Fitter in the state of Massachusetts. He loves the outdoors and spends his free time camping, being in or on the water, and hiking in the mountains. Prior to starting her career in development as the Advancement Coordinator for the Cushing Centers in 2010, Laurie helped to found and subsequently coordinate social and recreation programming for Teens and Young Adults with Down syndrome, sponsored by the MA Down Syndrome Congress. Laurie, who currently resides in Hyde Park, graduated from Harvard College with a BA in Sociology. Laurie is on the Board of Women in Development of Greater Boston. She is a health and fitness enthusiast. A certified running coach through the Road Runners Club of America (RRCA), Laurie coaches the Cardinal Cushing Centers Boston Marathon team as a part of her development and communications duties. Tom has worked at Cardinal Cushing Centers for more than thirty years, beginning as a Direct Care Worker, Weekend Supervisor before moving into the Recreation Department. Tom went to Massasoit Community College and Northeastern University. His main focus while in school was outdoor education and challenge course facilitating. His duties include providing recreational services for all of Cardinal Cushing Centers, their Adult Services Program and individuals with intellectual disabilities from the surrounding towns. He coordinates all aspects of Cardinal Cushing Centers Special Olympic programs, is responsible for overseeing our Challenge Course, and facilitates community programs. As the Director of the Values Committee he is responsible for coordinating activities that promote our Franciscan Values. He lives in Hanover and is the father of two beautiful young ladies. His family is very involved with Cardinal Cushing Centers and volunteer on a regular basis. Their family enjoys spending time together camping, skiing, and traveling. Jude Morgan has been in the field of education her whole career. She has been with Cardinal Cushing Centers since 2003. She is currently the Director of Education at Cardinal Cushing Centers – Hanover. Jude oversees the educational program for students from the ages of 10 – 18. Prior to working as the Director of Education, Jude was the Technology teacher (7 years) and a classroom teacher (4 years). Before working at Cushing, Jude was an Elementary/Physical Education teacher for 8 years at Abbots Farm Junior School in Rugby, England. Jude has a B.Ed. from Worcester University, England and a M.Ed. from Bridgewater State University. She currently holds professional licensures in Special Education Administration and Moderate Dis. 5-12. Ryan’s been with the Cardinal Cushing Centers’ Shared Living Program since 2017 where he’s been meeting with individuals and their teams, and matching them with the right qualified caregiver to provide supports in their home. The goal of the program is to be as individualized and person-centered as possible. Ryan comes to Cardinal Cushing Centers from Nonotuck Resource Associates where he provided residential supports to individuals with impairments. Here, he had several roles including AFC Case Manager, Shared Living Case Manager, and Placement Specialist for Nonotuck’s South East Offices. Before working with Nonotuck, Ryan was employed at Friendship Home in Norwell where he held a variety of roles. Ryan graduated from Bridgewater State University with a degree in Communications. Ryan, his wife, and his two daughters reside in Pembroke. They enjoy spending time outdoors as much as possible alongside their dog Roxy, the family’s Boston Bulldog. Ryan also enjoys sports and watching all the local teams whenever he can. Amy Purkis joined Cardinal Cushing Centers in 2012 and currently serves as the Director of Behavioral Services. Having started her career as a teacher, Amy holds an her undergraduate degree in elementary and special education from Boston University and a Masters in Education from the University of Maine at Orono. Amy has a particular interest in staff development and enjoys designing and presenting trainings for direct support staff. Her current projects at Cushing include implementation of a program wide PBS model and a restraint reduction initiative. Prior to Cushing Amy worked at Vinfen where she served as an assistant clinical director, overseeing programmatic and behavioral aspect of residences on the South Shore and Boston, including the emergency placement program. In this role she became a member of the DDS Peer Review Committee, a position she still holds. As a Board Certified Behavior Analyst who received her initial training in at the May Institute, Amy had presented at local and national conferences as well as having an article published in the Journal of Positive Behavioral Supports. Gina has been a human resources professional for over 18 years, specializing in the nonprofit sector. She joined Cardinal Cushing Centers in 2017 as the Director of Human Resources providing leadership, strategic planning and direction in all human resource functions including employee relations and retention, recruitment & onboarding, and training. Gina holds a B.A. in Psychology & Sociology from University of Massachusetts and a Certificate in Human Resources Management from Eastern Nazarene College. She began her career as a residential counselor working with at risk youth at Bridge Over Troubled Waters. She then worked in the mental health field assisting adults with becoming gainfully employed at the Center for Health and Development. Her vast knowledge in human resources has been attained by roles at Partner’s Healthcare, May Institute, and New England Village. Danielle Silverberg has been a Registered Nurse for more than 12 years. Since January 2010 she has held the position of Director of Health Services at Cardinal Cushing Centers. Prior to this she was a staff nurse at Cardinal Cushing Centers, Cape Cod Collaborative and Riverview School. In her current position she oversees the daily operations of the Health Center including 24/7/365 staffing of the Health Center, keeping medical records and doctor’s orders current. Danielle has a BSN from Utica College of Syracuse University. Prior to her role as AVP for Residential Programming, Ginger Sullivan worked for New England Villages where she served as the Director of Residential and Admissions. Within her current and previous roles, Ginger is responsible for the operational, financial and administrative operations of residential services. In her 20+ year career she has been involved in overseeing Medical Services, Transition/Turning 22 programs, Community Mental Health care and presently Education. In addition; her years of work have provided robust experience in relation to Human Resources and employee professional development. Ginger has dedicated her career to advancing services for individuals with disabilities. Ginger has a Bachelor’s of Science in Health Education and a Masters of Business Administration.